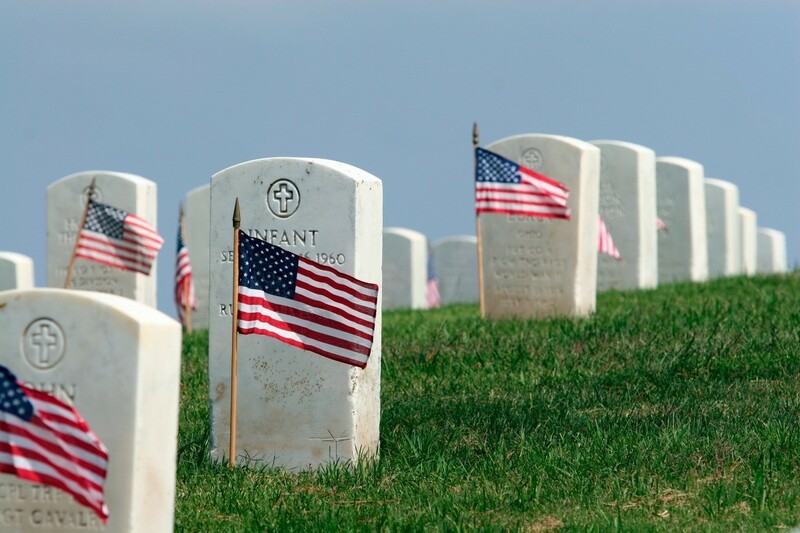 Originally established to honor the fallen soldiers who served during the Civil War, it was later expanded to honor all Americans who have died in military service. It is also a Federal holiday that is typically seen as the official beginning of summer. This is a guide about celebrating Memorial Day. 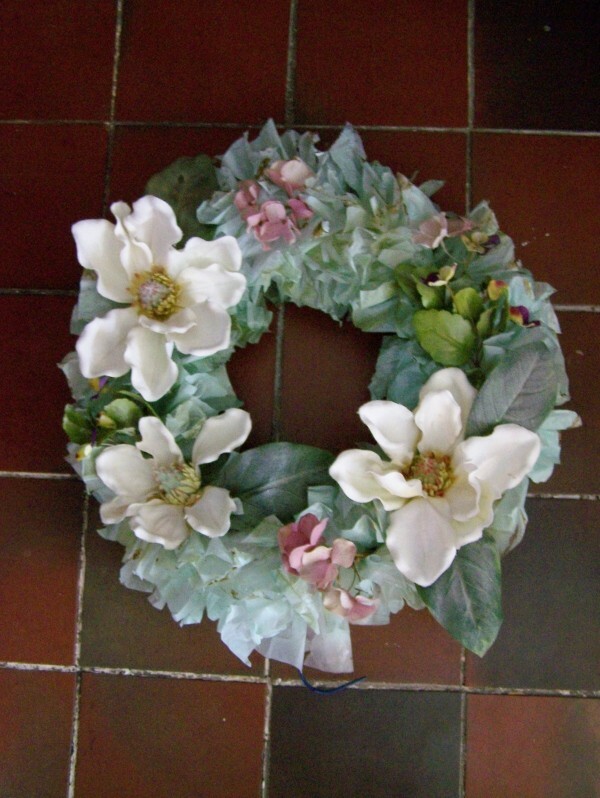 Many years ago my mother-in-law taught me to make this wreath and this year I am making it for her. Shape the hanger in a round shape and straighten out the curved hook for a stem to push in the ground. Any plastic bag will work, grocery bags or dry cleaner bags; the thing to remember is those with labels on them will take more paint if the label shows through your paint too much. Cut the bottom sealed thick part off the bag. Gather the rest of the bag together lengthwise keeping the edges as even as you possibly can. Cut across the plastic in around 2 inch slices. Lay aside until you get a sack full. Then, straighten out one slice, fold it in half again and again until it is around 8 inch long, cut into 8 inch strips. Tie these strips around your shaped wire; keep tying them on your hanger until you can't squeeze anymore in. Take all the time you need to separate the strips and fluff them out. 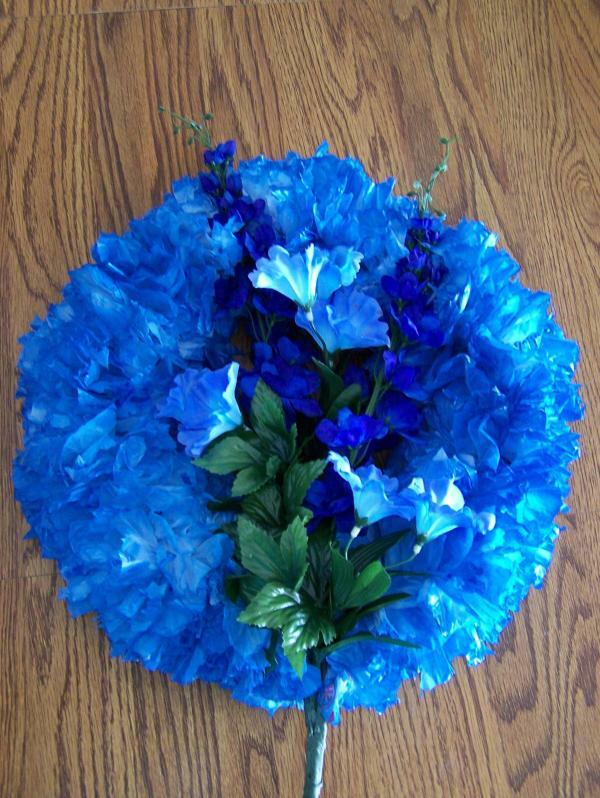 Paint your plastic strips with a quick drying latex paint and decorate by tying on the flowers or hot gluing them on. I like to use full stems and leave the stems as long as possible and secure them to the straightened hook to push in the ground, glue them together so you have only one stem. 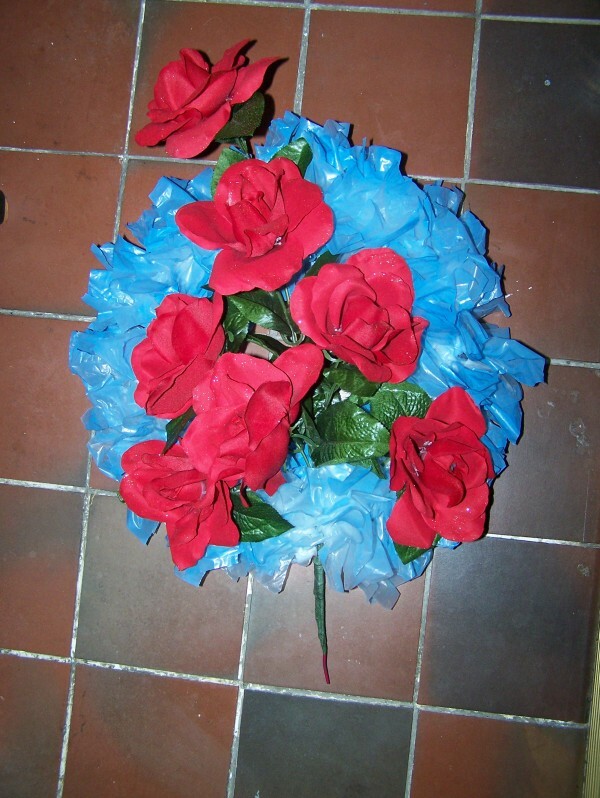 You can purchase lettering to attach to wide ribbon and glue across the wreath if you want, from florists. These are very easy to make and the kids can be involved. Make it fun and share stories of the people you are making them for as you are working on them to make it more interesting. An easy dessert for your backyard Memorial Day gathering is to set up an Ice Cream Sundae "bar" with several varieties of ice cream, toppings, chopped candy bar and cookie pieces, whipped cream, and cherries, of course. Kids love it and adults get pretty creative too! Don't forget the extra napkins! With Memorial Day weekend and the picnic season here, it's time to think about picnics. What are your favorite picnic ideas? This can include planning, organization, equipment, clean up, easy to carry foods and recipes. I have a great picnic recipe. I have never met a person who didn't like this dish. I give the recipe out often. It is easy to prepare, transport, and can be served hot-cold-or anywhere in between. I'm going to make this as brief as possible. If you have any questions about preparing the dish, please e-mail me. I never measure my ingredients, and I often substitute spices depending on the season, and what else is being served. The main component of the dish are prepared beans. If you are from the Northeast, you are probably familiar with Gramma Brown's Baked Beans, in the yellow can. They are a very dense, creamy recipe, and quite bland. You may substitute your favorite by draining most of the liquid. Mix all ingredients, and put into your cooking vessel of choice. These can be baked until bubbly with the remaining sugar sprinkled on top (you may also top with pineapple rings and marachino cherries to be festive). You may combined ingredients in a crockpot and keep warm on low heat, or in a dutch oven on the grill. You can warm this dish on the stove until the flavors meld, and serve while still warm, or refridgerate, and serve cold later. Enjoy! It's easy to get out on a picnic and then have nothing to serve the food on, keep it warm, take leftovers home, clean up the inevitable spills and grimy hands. Fill clean milk jugs halfway with water and freeze. Filling empty space in your freezer makes it work more efficiently -- and when you are preparing a cooler for a picnic or road trip, your frozen jugs will keep things cool without having to buy ice! Hang a sausage from a tree 20 or more feet from your picnic to distract bees from your festivities. Old sheets make good outdoor picnic table cloths. Take a colander or two to invert and place over bowls when on picnics to keep bees and flies out of your food. Wash a milk, juice or water jug and fill with water to take to a picnic so hands can be washed before eating and after clean up. Zip the bag closed getting out as much air as possible. 1/4 cup salt on the ice. Zip it closed and shake it (the kids love this part) until the ice cream is firm. Cut a corner off the small bag and squeeze the ice cream into a cup or bowl. Top with toppings of your choice. I like to take a 7 layer salad to picnics, it is always a hit and is often requested by those who have already tried it before. Arrange in layers in bowl, amounts are dependent to how big you want your salad. Each layer should cover the last. Tastes better if you refrigerate it overnight, this allows the flavors to blend. We have five kids and going on a picnic can be like planning a camping trip! We keep a Rubbermaid conatiner pre-packed with everything you normally tend to forget at least one of! Aluminum foil, hamburger turner, tongs for hot dogs, wet wipes, toilet paper, paper towels, old kitchen towels and dish rags and pot holders, etc. We used to keep plastic silverware in there, but through the years I have replaced that with our old mismatched metal utensils. I keep a box of gallon ziplock bags to place dirty utensils in to take home and wash. They also come in handy for kids collecting rocks, flowers, etc. And a roll of white kitchen trash bags for trash and larger items to be washed like plastic plates, etc. Or for wet clothes if they have gone swimming or gotten dirty. I keep old kitchen serving spoons, I have paper and re-usable plastic plates and bowls and cups, a plastic tablecloth and an old sheet to lay out on after we eat. When summer comes around and I know we will use it more often, I pack a ziplock full of bug dope, sun screen and a first aid kit. I also put matches in a separate ziplock to start a fire to cook or to keep warm. Even in summer, a fire helps to keep the bugs away. Another space-saving tip is to use an old film canister and fill with wooden matches. It will keep them dry and won't take up a lot of room. I also used to keep miniature ziplock bags (you can find them in the craft section at Wal-mart) and fill them with spices we like to use when we cook out. It saves on space in the bin instead of packing all of the spice containers. I would fill with the spices and then place them all together in one gallon zoplock so that they were all together. You can also buy in the camping/hunting section of the store this one container that has divided sections and is filled with salt, pepper, barbecue seasoning, etc. I never bought one because I am waiting to use up a similar container full of cake decorator candies and use that this year to fill with my own spices. how can I get gramma browns baked beans? I miss them now that I live in south Florida. I am looking for a sewing project for Memorial Day for the seniors. Check yesterdays post for Primitive Applique Flag Pillows. It sounds like the perfect project for those experience and those with no experience. I love our town's Memorial Day Parade and am thankful for the sacrifice of these men and the men and women currently serving our country. 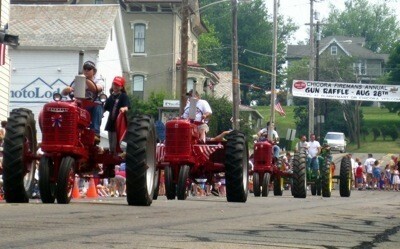 My boys love tractors and really enjoy the tractor portion of our town's Memorial Day Parade. It's such a fun time for them! I love how they look coming down the road.